Come on, pull the trigger, already! One of the things that consumes time and bogs people down is being slow to make decisions. We make hundreds of decisions every day. It starts with the decision to get out of bed each morning and what to wear each day. It continues with what we’re going to do each day, what to buy at the store, how we’re going to respond to that email, what direction to go on the big project at work, who we ask to fill a critical role, and on and on. I think if we actually added them up, we’d be amazed by the number of decisions and the amount of time we spend making decisions each day. We all want to make the best decisions possible, but improving the speed of our decision-making is an area where most of us have an opportunity to save time, reduce stress, and create momentum. Here are 7 tips that can help you make decisions more quickly. 1) Consider the Value of Your Time. Everyone likes a great deal, but sometimes we spend more times than it’s worth comparing prices. It really worth driving to 3 different stores to get the best price on a $15 coffee maker? Do you really want to spend an hour online researching new earbuds for your MP3 player? On a larger scale, do you really need to do 3 months of market research or conduct 5 focus groups before making that change to your product or service? Maybe, but not if the cost of the research is more than the cost of making the “wrong” decision. 2) Get the Right Information. Sometimes we get stuck on a decision because we don’t have all the information we need. Maybe you need the latest sales figures. Maybe you’ve got second-hand information and you need to talk with someone who has first-hand experience. Maybe you need to see a specialist instead of diagnosing your condition using online medical websites. Instead of fretting over unknowns, figure out the information you need to make a good decision and get it. Sometimes we just can’t seem to figure out the best decision because we haven’t spent focused time thinking about the decision in a logical way. A simple way to move towards a decision might be to write out a pros and cons list. Then you can weigh which pros and cons are most important or most likely to occur. On more complex problems, some degree of risk analysis may be needed. 4) Recognize the cost of inaction. We often drag out decisions because we’re afraid of the consequences of a bad decision, but it’s important to consider the cost of inaction as well. Sometimes it’s good to take a little extra time to think about, discuss, or sleep on a decision. But sometimes every day a decision isn’t made the cancer spreads a little more, a competitor gains an edge, or employee moral gets worse. It may be the kick in the pants we need to make an imperfect decision sooner rather than later. 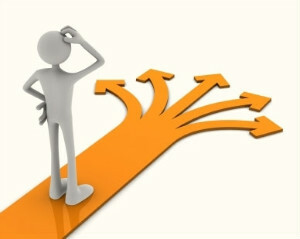 Indecision creates uncertainty and frustration, but the flip side decisions lead to action. Action moves you forward. Moving forward creates momentum. Momentum is positive energy. Which of us doesn’t want more momentum and energy in our lives and organizations. 6) Don’t Try to Be Perfect. A lot of us drag out decisions because we don’t want to be wrong. First of all, remember that nobody is perfect; even the best leaders make mistakes. Second, rarely does one bad decision destroy a person or organization. Most of the time you can correct for one bad decision. It’s usually a series of bad decisions compounding each other that causes a person or organization to implode. 7) Move Forward with Tough Decisions. Sometimes we know the decision we need to make, but we’re afraid of the consequences, so we continue to hem and haw over it. You know it’s going to be hard to fire that underperforming employee or break off that dead end relationship or cut back on personal expenses to get out of debt, so you continue to revisit the decision even though you already know what you’ve got to do. Are there any areas in your life where you’re struggling to make timely decisions? Do you have any additional advice that can help speed up the decision-making process?